In this lesson, we will learn how to use zeros to write a polynomial function of the least degree with integral coefficients. Find, in its simplest form, the quadratic equation whose roots are − 3 and − 8 . Find, in its simplest form, the quadratic equation whose roots are − 1 4 𝑖 and 1 4 𝑖 . Find, in its simplest form, the quadratic equation whose roots are − 4 + 5 𝑖 and − 4 − 5 𝑖 . Which quadratic equation has roots 𝑥 = 2 ± 𝑖 ? Find, in its simplest form, the quadratic equation whose roots are 7 2 and 2 7 . Find, in its simplest form, the quadratic equation whose roots are 5 + √ 2 and 5 − √ 2 . Find, in its simplest form, the quadratic equation whose roots are − 2 √ 5 + 3 and − 2 √ 5 − 3 . Find, in its simplest form, the quadratic equation whose roots are 2 + 3 √ 7 𝑖 and 2 − 3 √ 7 𝑖 . Find, in its simplest form, the quadratic equation whose roots are 2 + 2 𝑖 − 1 + 𝑖 and 2 + 4 𝑖 2 − 𝑖 . 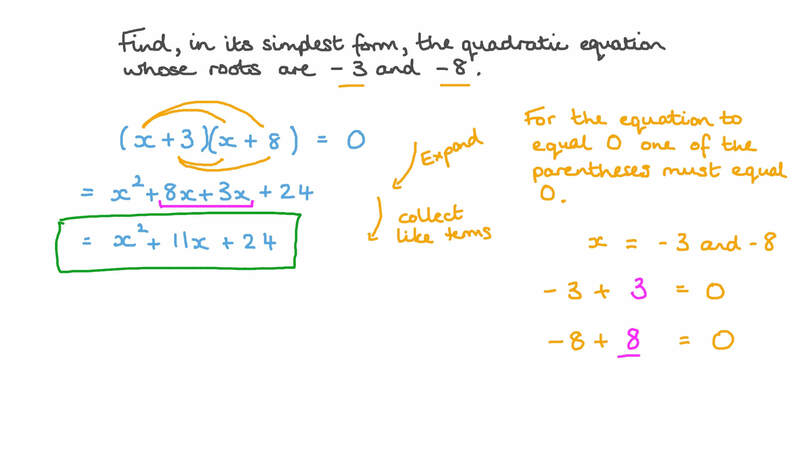 Find, in its simplest form, the quadratic equation whose roots are 2 and 8. Find, in its simplest form, the quadratic equation whose roots are 9 − 1 2 𝑖 and 9 + 1 2 𝑖 . Find, in its simplest form, the quadratic equation whose roots are 1 2 𝑖 and − 1 2 𝑖 . Find, in its simplest form, the quadratic equation whose roots are 1 + √ 5 and 1 − √ 5 . Find, in its simplest form, the quadratic equation whose roots are 2 √ 2 + 6 and 2 √ 2 − 6 . Find, in its simplest form, the quadratic equation whose roots are 6 7 and 7 6 . 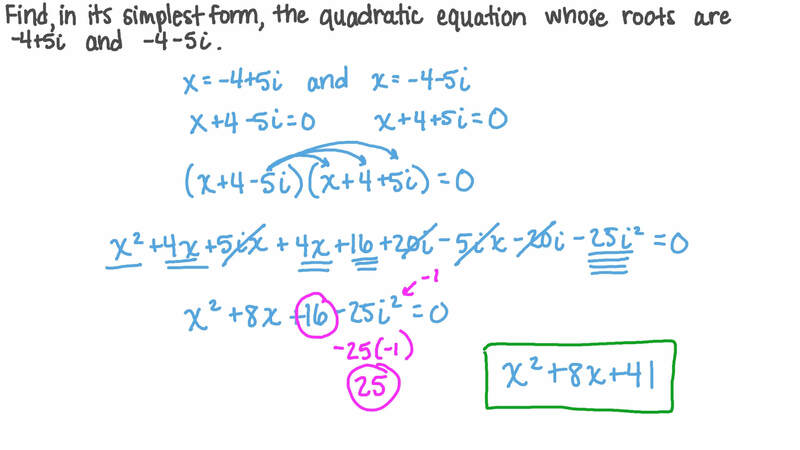 Find, in its simplest form, the quadratic equation whose roots are − 3 5 and − 5 3 .